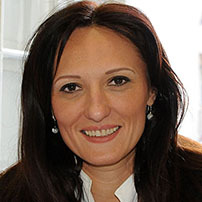 Gordana Nikolić, PhD is a founder of Business Academy Rijeka which promotes lifelong learning from 2007 through different projects and cooperation modalities with international scientific institutions. It is an Academy that carries out cooperation activities and advocacy for research institutions to promote their projects and organization of seminars, courses and lectures related to business management. This has resulted with forming of institution for higher education PAR University College in August 2011 as the only accredited private university college in Primorsko-goranska region of Croatia by Ministry of Science, Education and Sports. Currently, Gordana is a Dean of PAR University College and she also established the PAR Institute for lifelong learning, Center for Innovation and Entrepreneurship and Entrepreneurship VET Center and some other companies. Gordana is an ambassador within the European women entrepreneurs’ network and WED network of ambassadors. For her work she received a several awards, out of which the most important one is for the Women entrepreneur of the year in Croatia in 2015. Her science carrier started as a research assistant at The Faculty of Economics and has a Master of Science and PhD in Economics, earned at University of Rijeka. She is an author and co-author of several books and more than 30 scientific and professional papers and has worked on different programmes and projects for the Croatian Ministry of Science, Education and Sports. Each institution founded by Gordana has the purpose of preparing clients for continuing their business careers and facilitating students for their successful embarkation into the business world.